I love, love, love lemon. I especially love a really lemony cake and this recipe fits the bill. The recipe says to use a tube pan but I used a bundt pan and I am thinking that it would be better in a tube pan. I had a heck of a time getting it out of the bundt pan even though I had greased it very well. The cake has a tender crumb which might have something to do with it. 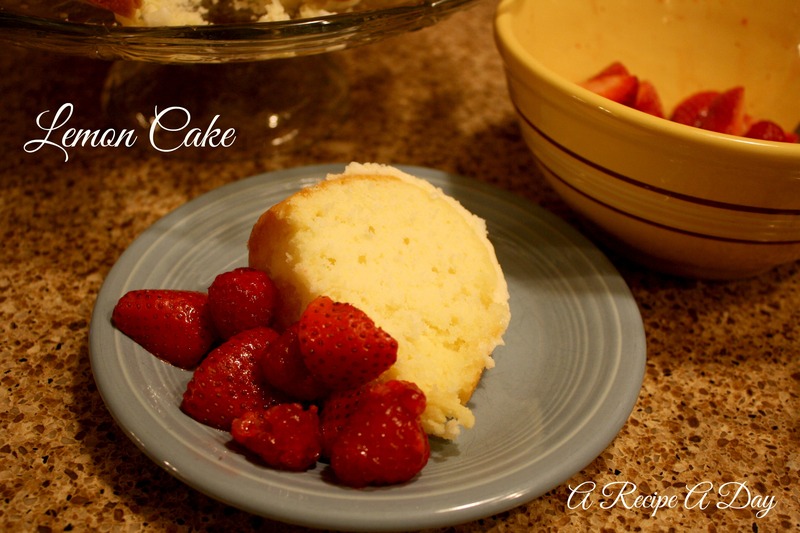 It’s an easy cake to make and please use fresh lemon juice and zest ~ it makes a huge difference. To make the cake, mix flour, baking powder, and salt together in a small bowl. Beat butter and sugar in a mixing bowl until light and fluffy. Add the eggs, one at a time, beating well after each. Beat in dry ingredients alternately with buttermilk, beginning and ending with dry ingredients. Beat in lemon zest and lemon juice. Pour into well-greased tube pan. Bake at 300º (yes, that’s the correct temperature) for 50 minutes or until a cake tester inserted in the middle comes out clean. Cool in the pan for 10 minutes. Invert onto serving plate. To make the glaze: Beat the ingredients in a small bowl until well mixed and smooth. Drizzle over cool cake. 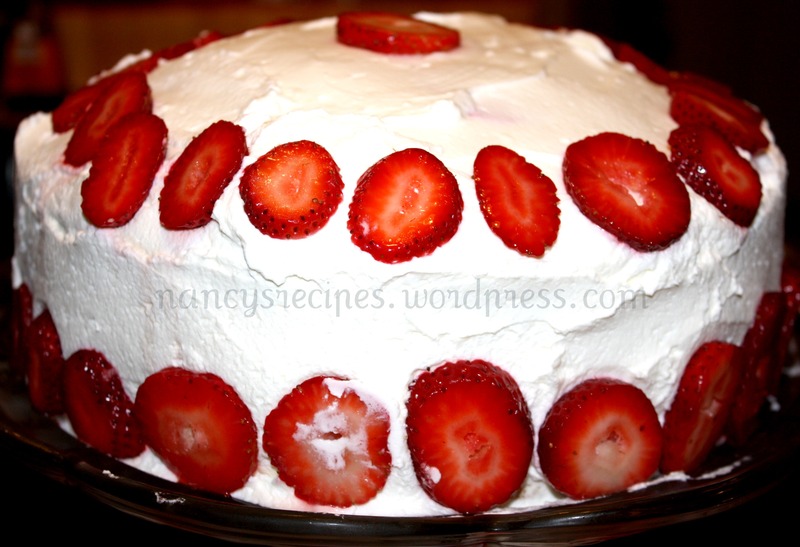 Serve with fresh berries if desired. Makes 12 servings (at least). Well, I’ve made Guinness cupcakes and brownies so it only stands to reason that I would eventually make a Guinness cake. This cake is very moist and delicious. After a day or two, it tastes even better. For the frosting, the directions said to make it look like the head of a glass of Guinness but I am not thrilled with all that drippy frosting so I just frosted the top with no dripping on the sides. Preheat oven to 350º. Line the bottom of a 9 inch springform pan with parchment paper, then butter the parchment and the sides of the pan. Pour the Guinness into a saucepan and add the butter by the tablespoonful and heat until the butter is melted. Whisk in the cocoa and sugar and set aside. Beat the sour cream with the eggs and vanilla in a large mixing bowl. 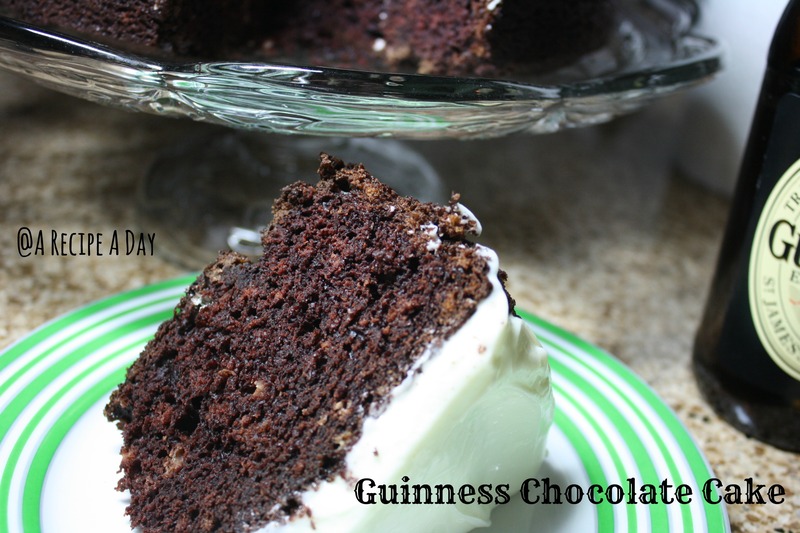 Pour the Guinness mixture into the sour cream mixture and whisk in the flour and baking soda. Pour the batter into the prepared ban. Bake for 45 minutes to 1 hour. Mine took 1 hour exactly. Let cool completely on a cooling rack. When completely cool, remove from pan and set on a cake stand. I put the cake stand on top of the cake and flipped it right side up so that the bottom of the cake became the top and I was able to remove the bottom of the springform pan and the parchment paper. The bottom is also smoother and flatter to frost. Frost the top of the cake so that it looks like a head of a glass of beer. Lightly whip the cream cheese until smooth with a mixer. Sift in the sugar and beat together. When smooth, beat in the heavy cream. Frost top of cake using all the icing. This was a favorite of ours years ago and I decided it was a good time to bring it back. It’s very easy to make which is a plus! This is the same Bacardi Rum recipe that was in every magazine in the 70’s and can now be found in almost every community cookbook published. It’s a winner! I just filled up the middle with fresh fruit but otherwise made exactly as the recipe states. Grease a 10 inch tube pan or a bundt pan and sprinkle pecans over the bottom of the pan. Mix together the cake mix, pudding, eggs, water, oil. and rum. Pour over the nuts in the prepared pan. Bake at 325º for 1 hour or until toothpick inserted in the middle comes out clean. Cool in the pan for 10 minutes. Invert onto a serving dish. I did it a bit different. I inverted onto a cookie sheet until it was glazed and then I carefully moved it to my serving plate. For the glaze: Melt butter in a saucepan. Stir in the water and sugar. Boil for 5 minutes, stirring constantly. Remove from heat and stir in the rum. Brush glaze over the top and sides of the cake. Allow cake to absorb the glaze. Repeat until glaze is used up. 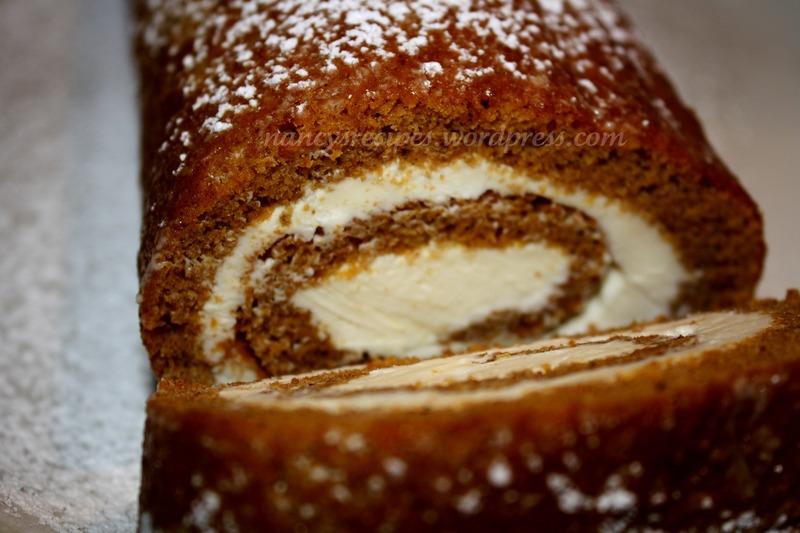 I love pumpkin rolls ~ well, actually any kind of roll but pumpkin is my favorite. This really isn’t hard to make it just takes a bit of time. Make sure you put enough powdered sugar on the tea towel so that the cake won’t stick to it! I’m always surprised that I can make these since I’m somewhat of a bull in a china shop in the kitchen at times, LOL! 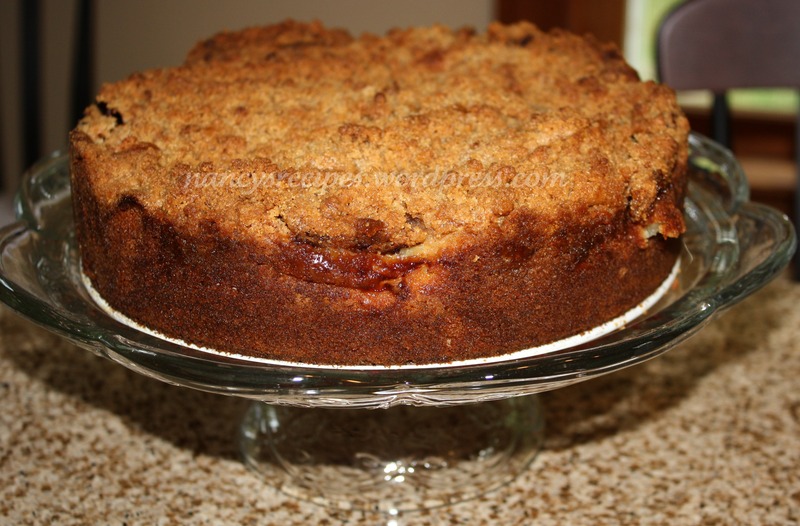 It’s so delicious and looks great as a dessert for Thanksgiving or Christmas. Preheat oven to 375°. Grease 15 x 10-inch jelly-roll pan; line with wax paper. Grease and flour paper. Sprinkle a thin, cotton kitchen towel with powdered sugar. Mix flour, baking powder, baking soda, cinnamon, cloves and salt in small bowl. Beat eggs and sugar in large mixer bowl until thick. Beat in pumpkin. Stir in flour mixture. Spread evenly into prepared pan. Sprinkle with nuts, if using. Bake for 13 to 15 minutes or until top of cake springs back when touched. (If using a dark-colored pan, begin checking for doneness at 11 minutes.) Immediately loosen and carefully turn cake onto towel sprinkled with powdered sugar. Carefully peel off paper. Roll up cake and towel together, starting with narrow end. Cool on wire rack. Beat cream cheese, 1 cup powdered sugar, butter and vanilla in small mixer bowl until smooth. Carefully unroll cake. Spread cream cheese mixture over cake. Reroll cake. Wrap in plastic wrap and refrigerate at least one hour. Sprinkle with powdered sugar before serving, if desired. 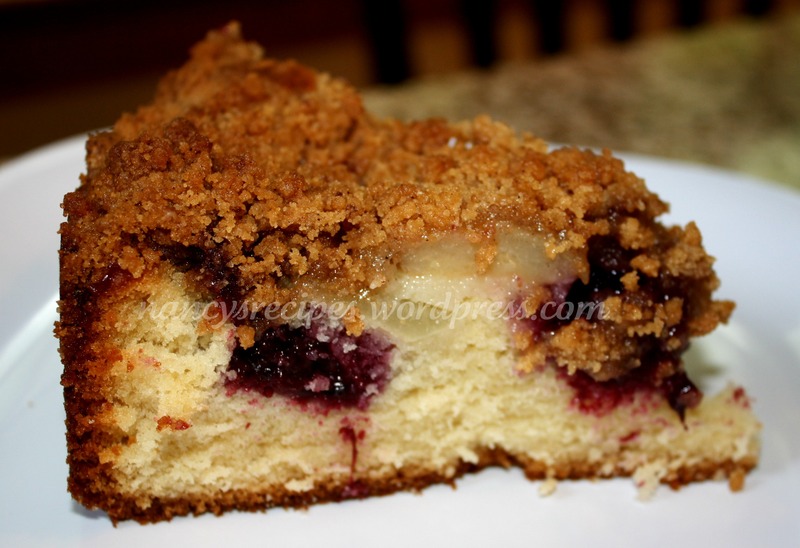 This is such a good coffee cake. The cake comes out very tender. I used white-fleshed peaches as my store had them on sale but you can use the regular peaches. I also think this would taste good with apples instead of the peaches. I used a very small package of blackberries and it was plenty. You will also need a springform pan (9 inch) for this recipe. I’m almost certain this is Southern Living recipe but, as always, I could be wrong. It’s one of those recipes that I had written down awhile ago and neglected to write where it came from. Beat butter with mixer until creamy and gradually add both sugar and beat well. Add the flour and cinnamon and beat until blended. Set aside. Beat butter with a mixer until creamy. Gradually add sugar, beating well. Add eggs, 1 at a time and beat after each until blended. Combine the flour, baking powder, and salt. Add to the butter mixture alternately with the milk beginning and ending with the flour mixture. Beat at low speed after each addition until blended. Stir in the vanilla. Pour the batter into a greased 9-inch springform pan. Top with the blackberries and the peach slices. Drop the streusel over the top of the fruit on the cake. Bake for 1 hour and 10 minutes to 1 hour and 20 minutes or until center of cake is completely cooked. Mine took 1 hour and 20 minutes. Before I go any further, Black Forest Cherry Cake is my all-time favorite cake. In fact, we had one for our wedding cake. That’s how much I love it. 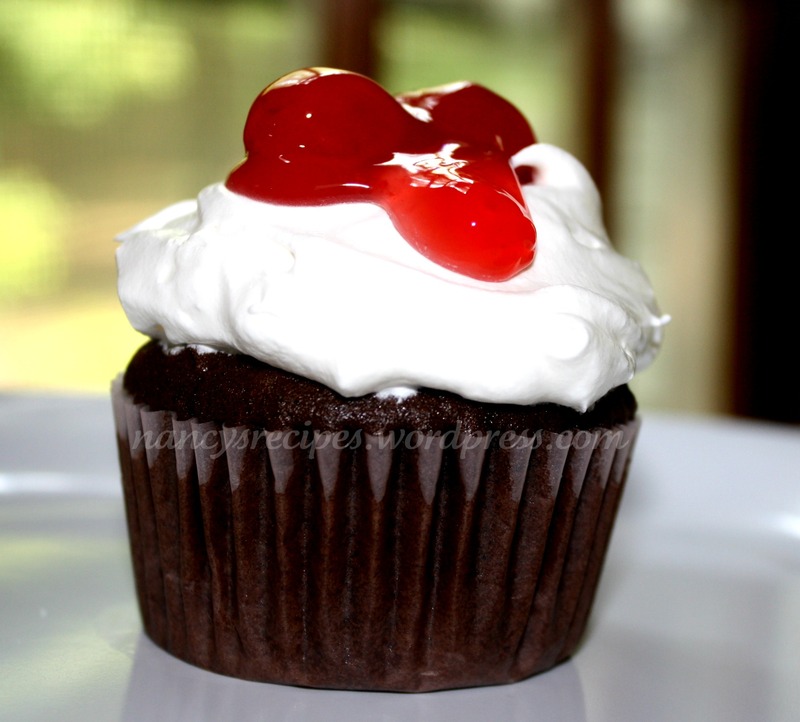 A few weeks ago, I was reading The Disney Food Blog (one of my very favorite blogs) and came across this post ~ Black Forest Cupcake. I could NOT stop thinking about it and since I won’t be going back to WDW for a few months, I sent my son (who lives in Orlando) to check it out. He ate at the Contempo and said the cupcake was one of the best things he had ever eaten. That was all it took to send me on a mission to recreate it. As luck would have it, I did a google search and came up with a copycat recipe for regular sized cupcakes. Being diabetic, I should NOT be eating these at all so I saved up some carbs so I could try it. I wish I hadn’t. They are VERY good. I am looking forward to trying the real thing when I get back to the World. And I ate more than one. Heat oven to 350º. Prepare cake batter as directed on package and set aside. Mix cream cheese, egg and sugar until well blended. Remove 3/4 cup of the cherry pie filling for garnish; set aside. Spoon 2 tablespoons cake batter into each of 24 paper-lined medium muffin cups. Top each with 1 tablespoon each of the cream cheese mixture and the remaining cherry pie filling. Cover evenly with remaining cake batter. Cool 5 minutes; remove from pan to wire racks. Cool completely. Top with whipped topping and reserved cherry pie filling just before serving. Keep in refrigerator.